for an enjoyable and successful camping trip. Camping tents protect you from the sun, wind, and rain. They protect you from insects, flies, mosquitoes, and other no-see-ums. The following articles will help you pick the perfect tent for you and your own individual needs. A tent provides a place to store your camping gear inside away from the weather. And it also gives you a place to go for a little privacy. You do need a good tent when you go camping. your shelter from the weather. Choosing a Camping Tent – WHICH ONE? There are so many different kinds of camping tents out there! Even an experienced camper is easily confused by the bewildering variety of tents available. When you venture forth searching for a new tent, the first thing to do is determine your specific camping requirements. Ask yourself a few questions to help you get a better idea of what you’ll need. Then before you go looking, consider the cost and decide how much you really intend to spend. That way, you can keep it reasonable and you won’t overspend your budget. Think about how big your tent ought to be. Take into consideration how many people will be sharing the space. Then, think about its weight. If you are car camping, it’s not a big deal, but if you’re planning on carrying it very far, you’ll probably opt for a light-weight tent. Choosing your tent’s color is another important step toward making the final decision. You might not think that the color is important, but there are a few color facts that you need to know about. Are Certain Features Important to You? There are some tent features every quality tent will have. Make sure the shelter you choose will fulfill your basic requirements. What Type of Tent Is Appropriate? What type of camping are you planning for? That is an important factor in determining the perfect tent. Will you be car camping or backpacking? If you are just camping in the summer time, your needs are much different than that of a hiker who is out in tougher weather conditions such as rain or snow. 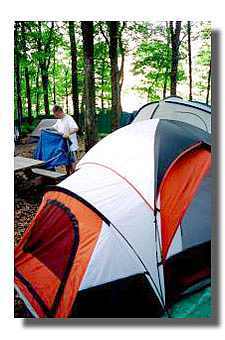 There are several different types of tents for camping. Each type is designed for different weather conditions. Along with the different types, tents come in many, many styles and shapes. All of them are designed for different outdoor activities. Knowing the different functions of the styles and shapes is crucial in your decision. A tent’s shape and style is a very important aspect to consider for your outdoor adventure. There are many different tent manufacturers. All have their own unique name and design. Some are known to be cheap and inexpensive. Others are known to be high quality and pricey. All tent brands are quite different. Some names you may recognize are: Wenger, Coleman, Greatland, and Eddie Bauer. It’s a good thing to know how to care for your camping tents. When cleaned and cared for properly, it will last a lifetime. Take good care of your tent, and then you’ll enjoy every camping trip without the added stress of an inefficient and useless tent. There are some things you can do to extend the life of your tent. Check our tent repair products for items such as zipper repair, seam sealing and general tent repair kit. Proper pitching is an important part of making your camping shelter efficient and comfortable. It's good to know the right places and methods for setting up camp. Kids Like To Go Camping, too! When you take kids tent camping, they love to have their own gear. Any adventurous kid wants their very own kid tent on the camping trip. Kid tents are perfect to share with a friend or to enjoy a backyard campout. Camping is a wonderful experience, but the heat is almost unbearable in the summer time. Tents seem to attract the heat during the daytime. Use a portable tent air conditioner to make your camping trip more enjoyable. It will keep you from scorching! Also consider putting up a camping tarp over your tent and sitting area, you'll be grateful for the shade. You don’t always have to depend on tents for shelter from the weather. Some hikers and bikers like to use light-weight bivys for shelter. Others use special hammocks. On the other end of the scale, some campers like to be more civilized on their camping trip, and take along RVs, tent trailers, etc. Camping tents are your protection from the weather.